Playing the trumpet is as natural as breathing to James Ackley of Manchester. Even before entering the fifth grade, Ackley showed talent in music and was playing percussion instruments in school, following up with performances on the trumpet. Even though he excelled in math in high school in his native Ohio, and was interested in engineering, he followed the advice of his mentor there and entered into the world of the trumpet. “My teacher told me if I had any doubts in the future about playing the trumpet, I would regret them. He said, ‘You don’t choose to be a musician, music chooses you.’ I totally agree with that and went with my heart. I went straight into music in my senior year, and the trumpet became the focus point of my life,” Ackley says. Ackley is continuing his lifelong love affair with the trumpet, beginning his fourth year as assistant professor of music in trumpet performance and chamber music at the University of Connecticut. He is also director of the university’s brass and performance departments, as well as conductor of the UConn Trumpet and Brass ensembles. “I have great students. I conduct their concerts and they are fantastic to work with,” Ackley says. 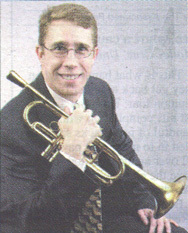 Ackley’s talents also extend to being trumpet soloist with the Manchester Symphony Orchestra and Chorale. Ackley became involved with the organization when he was advisor to the wife of MSO conductor Lewis Buckley when she was at UConn pursuing her master’s degree in French horn performance. As part of his MSOC community involvement, Ackley instructs a master class in trumpet for students in Manchester public schools — working, in part, in conjunction with Keith Barry, coordinator of music for Manchester school as well as conductor of the Manchester High School Band. One of Ackley’s current interests lies in Latin folk music, which he arranges for several ensembles. He has recorded many CDs for numerous Latin American symphony orchestras, plus international TV, radio, and movie scores. As an international trumpet solo artist, he has appeared with many Latin American and United States orchestras.